Congratulations! You’ve signed up for SAP, probably S/4HANA. You’ve engaged an implementation partner and you are putting together a robust project plan, possibly around Agile methodology. Your budget has been signed off, your timelines approved and the business is engaged. Everything is ready to go! Exciting times lie ahead. It may seem like a long way off, but you must plan for how your team will look after you have gone live. If you are on an old legacy system(s), then it is more than possible that you have a very small team, perhaps only one or two people, looking after your system. You must realise by now, that this is just not going to cut it in an advanced SAP environment, where everything is interconnected and the potential is almost limitless. So how do you structure your team? There has been much talk recently about moulding a Centre of Excellence (CoE) team for SAP. This is not just another buzzword. A CoE should be structured in such a way as to allow fast paced reactive and proactive responses to business needs. It needs to have representation from all areas of the system as well as interdependent links with the wider business community. This last point is crucial: one of the primary functions of your CoE is that it has open and honest communication flow with business stakeholders. Without this, your team will become a reactive mess with a poor reputation. A typical CoE structure might look like the diagram below. 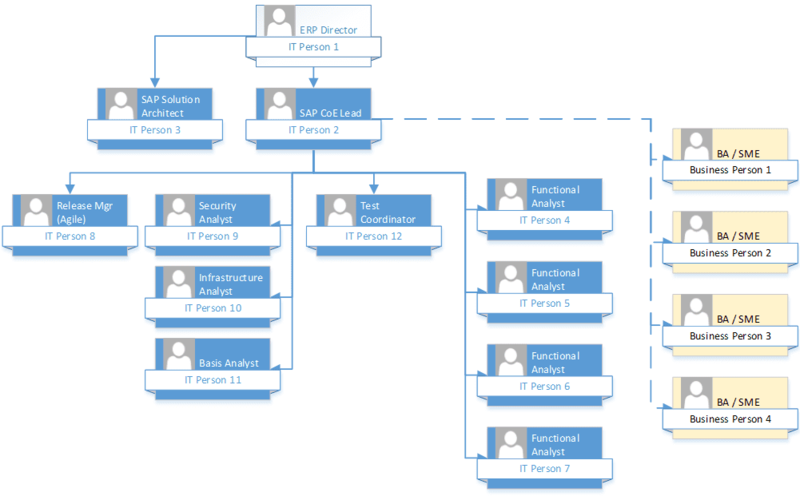 This is a CoE for a small to medium sized company using SAP; larger companies will need more bodies in the individual roles and with that comes more hierarchy (it is not sensible or practical to have dozens of people reporting into one CoE Lead). More and more these days, companies are driven by standards and the CoE is no different. The CoE Lead’s role will be to ensure that projects and enhancements are implemented to certain well-defined standards of compliance. Their role is to ensure that their team is fully aware and they have “bought in” to these standards. A key interaction for the CoE lead will be with key stakeholders in the business. These stakeholders will normally be operational leads who are looking for process improvements. The CoE must prioritise these requests appropriately according to time, budgetary constraints and potential return on investment, whilst maintaining their management responsibilities such as keeping a vibrant, engaged and enthusiastic team happy. The Solution Architect is an SAP expert, normally from a functional or technical background and with a high degree of respect amongst their peers. They have a good understanding of the touch points between systems and will have good knowledge of market trends in SAP. New technologies in the SAP space will be explored by the Solution Architect first before any formal recommendations. The Release Manager will oversee the life-cycle of SAP projects and enhancements. They will work closely with any Project Managers in the business, ensuring that release calendars are adhered to and all enhancements and projects are subjected to the correct rigour in terms of approvals. The Security Analyst role is vital to maintain a robust business process, with effective segregation of duties. The work of the Security Analyst should not be overlooked or, as often happens in hectic projects, pushed to the back of the queue. They should be involved in the solution from the word go, so they can structure and maintain security levels in a proper manner. 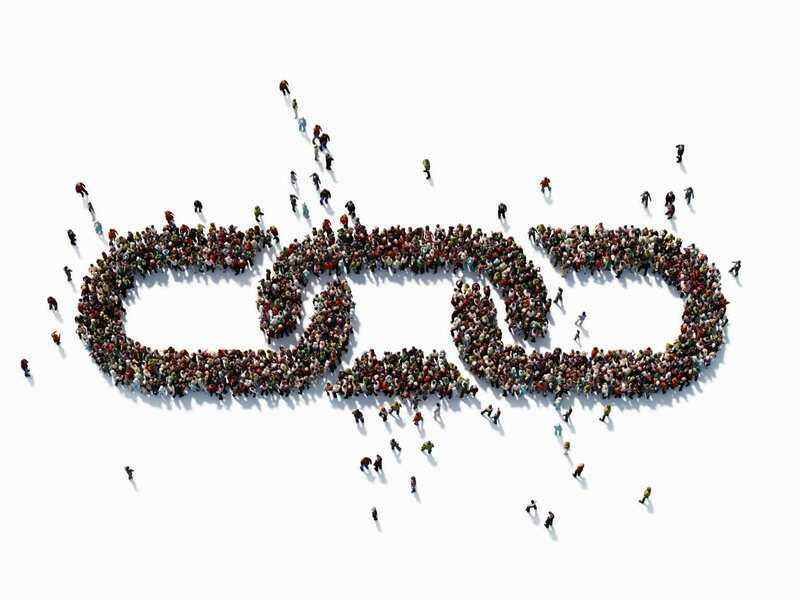 This is often merged with the Basis Analyst role, but with the emergence of new SAP architecture in the cloud and connections with other platforms, it makes sense especially in a large organisation, to separate out these roles. The Infrastructure Analyst’s brief is to ensure that the connections with the SAP system are healthy, robust and above all secure. The Basis Analyst is key to ensuring the smooth running of a complex SAP system. They will identify and fix issues ahead of them becoming potential horror stories, as well as “keeping all the lights on”. The Test Coordinator’s role can be explained quite simply: to ensure that adequate test resources (people and systems) are available for testing the latest enhancements and projects. As a result, the Test Coordinator is closely aligned with operational staff in the wider business so that user acceptance testing is carried out in a timely fashion. These people are the bread and butter of any SAP team. They hold in depth knowledge in their specific areas and are vital to the success of any SAP environment. The CoE Lead should keep a close eye on these guys; workload issues are often a major problem here leading to bottlenecks in this area. This just leaves the final group I have included: the Business Analysts (BAs) or Subject Matter Experts (SMEs). These would normally be included in all interactions with the CoE but do not necessarily report direct to the CoE Lead. In fact, it would be more beneficial if these were true business people rather than IT people, as they need to be aware of the business requirements and translate these requirements into IT requests. They are the conduit between the operational business folk and the CoE. What should be the Mission of the CoE? I would recommend that at the heart of any CoE vision or mission statement should be collaboration and innovation. The CoE must be at the heart of the business, with strong ties to all key stakeholders, meaning that building effective relationships should be one of the key soft skills in the team. And the team must innovate – always press for newer and better ways of doing things. The Japanese “kaizen” methodology works well in CoEs. The word “why” should be on everyone’s lips at all times and “because that’s how it’s always been” should be good enough reason to throw it in the bin! How should the CoE be run? For a CoE to be effective, the bulk of the investment should ideally be placed in the “Enhancements and demand” bucket. That is where a business is likely to get more of a bang for its buck – in other words, the return on investment is likely to be much higher in this area. Some companies like to separate out the functional analysts into either support analysts or project and demand analysts. This can be an effective way to parcel out the work, but beware that there needs to be a good degree of flexibility to cover any areas where the workload is becoming onerous. Projects undertaken by the CoE would benefit from using the SAP Activate methodology as succinctly described in this Eursap blog post. Architecture, governance and strategy is the domain of the Solution Architect, but other functions within the CoE can also have a leading role in the area. For example, the Infrastructure Analyst and the Basis Analyst would have an input into the selection of a Document Management System. Similarly, functional analysts may have a view on how the business should govern their master data. A ticketing system is essential for managing demand in the CoE. Clear requirements must be maintained within the ticketing system and it should be open for users across the business to see the workload and the priorities. A good ticketing system will also ensure that compliance issues such as Segregation of Duties and Sarbanes Oxley are addressed correctly. It is not the intention of this blog to recommend a ticketing system – there are many on the market which offer all these functions. Now! It is never too late. The key is budget. Get it in the budget as soon as you can – if possible, before your implementation. If not, then better late than never. If implemented correctly, a CoE can make the difference between a reactive, chaotic organisation with little value, and a slick, fast moving, proactive organisation which lives on the cutting edge of what is possible. Which one would you rather work for? Good luck with making your SAP Centre of Excellence Excellent! Need to hire resources for your SAP CoE? Looking for work in an SAP CoE?